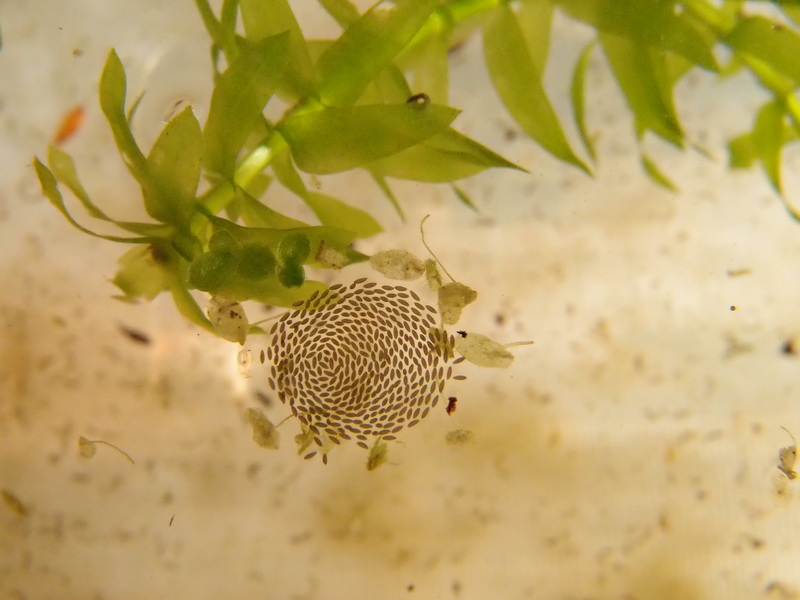 While cleaning tanks with fry, I discovered this egg raft, probably from a Chaoborus phantom midge. 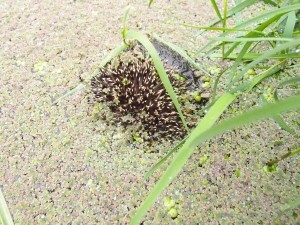 The mother has emerged in the fish tank, and laid her eggs on the surface. I don’t know if it is very easy to spot, but on this photograph an egg with a developed embryo. You can see its right eye and it’s an Austrolebias charrua (“Canal Andreoni”) from peat collected in June 2018. 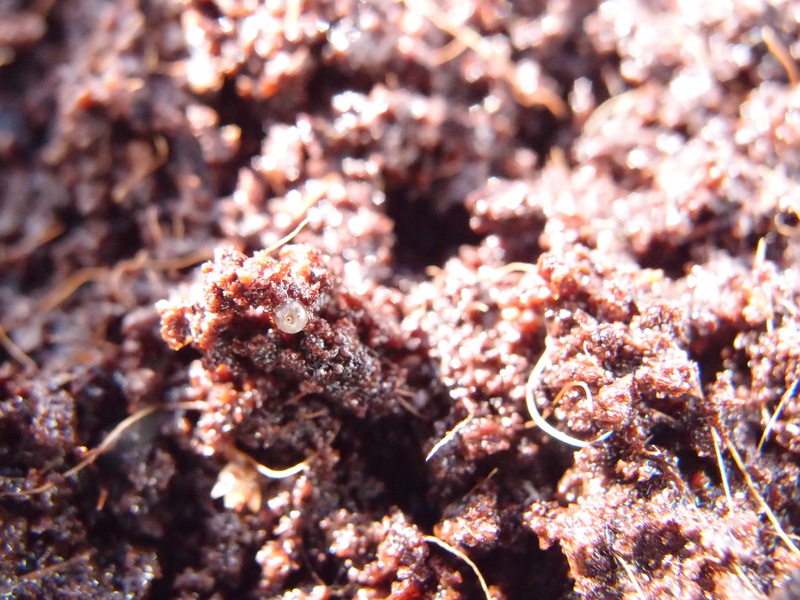 Particular about this embryo is that it overwintered without heating, in a box with peat standing next to the cold tanks. It has been at temperatures as low as 4C, maybe even 2C. I will try to convince it to hatch in April, when night temperatures in the garden house rise above 10C. Time to get going again. The first juveniles are in the garden already, and other batches are getting ready to go as well. I’m hatching some five to ten lines per month now. Not that all tanks are empty. On the contrary, species that made it through winter this year without heating are A. melanoorus (“R5km399”), nigripinnis (“Franquia”), charrua (“Canal Andreoni”), paucisquama (“Sao Sepe”), vazferreirai (R44km44), Cynopoecilus melanotaenia (“Paso del Dragon”), bellottii (“Maschwitz”), duraznensis (“Paso San Borja”) and the man on the photograph. He’s a luteoflammulatus (“R9km205”). Unfortunately the female in the same tank didn’t make it, but they were laying eggs until December. Christmas eggs. Things break down. 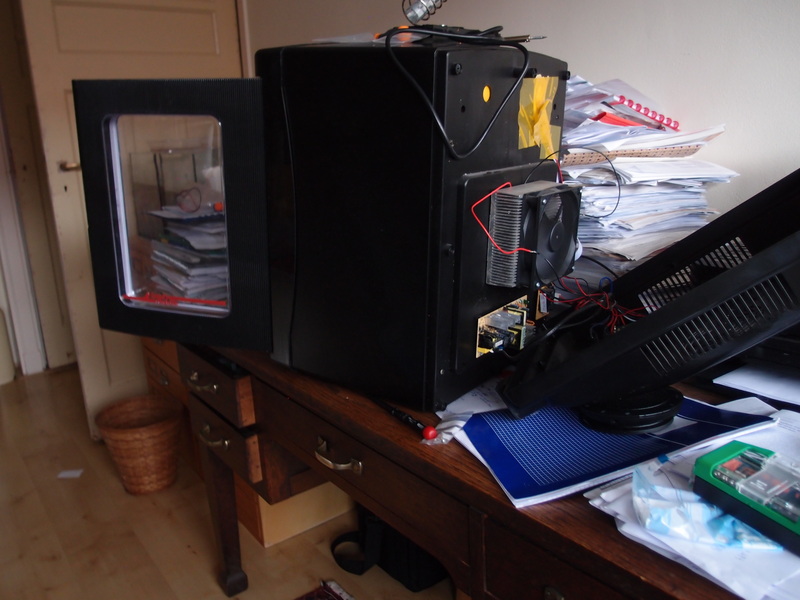 Fortunately, this type of small incubator usually does so in the same way: its Peltier element that cools and heats dies. The repair costs a few euros and takes less than an hour. 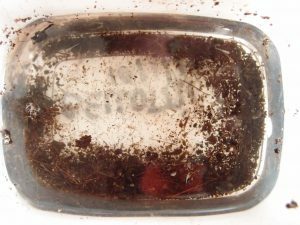 So by now, the incubator is filled again with eggs of several killifish species and fry in their first week after hatching. As it is springtime, I am germinating chillies in it too. This is how I grow fish at home during winter. 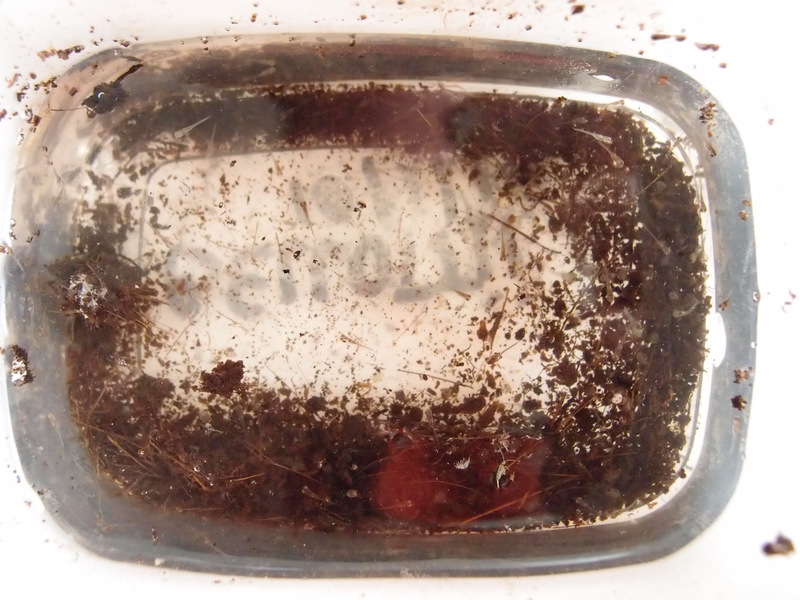 They are hatched in a small Peltier incubator, and kept in there for a few days with Artemia as the main feed. 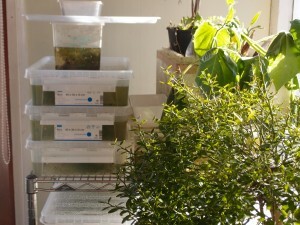 After that they are transferred to relatively flat boxes with tap water, rain water and java moss. The food then becomes a mix of Artemia, Daphnia, copepods and tubifex or blackworm. Great at that point is that mortality can be almost avoided completely if the tanks are not crowded. 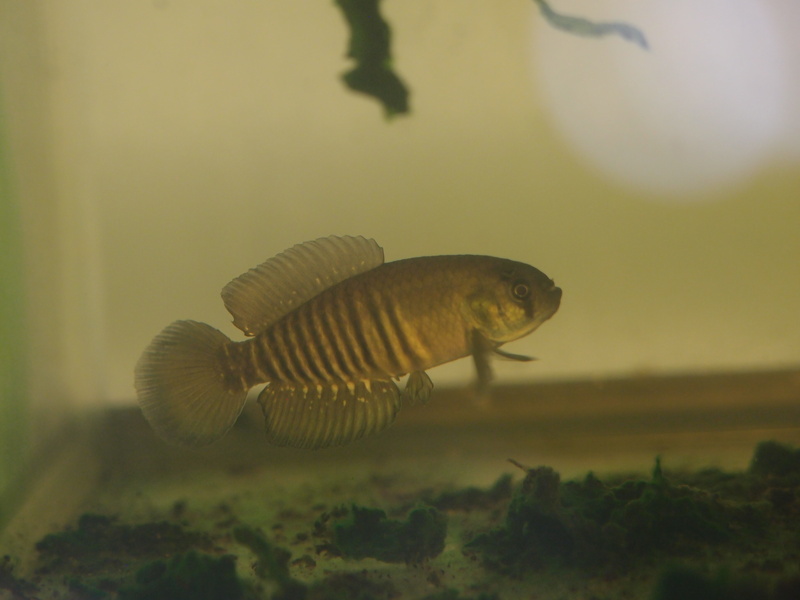 You should count an Austrolebias alevin from a small species per 150 square centimeter tank surface. 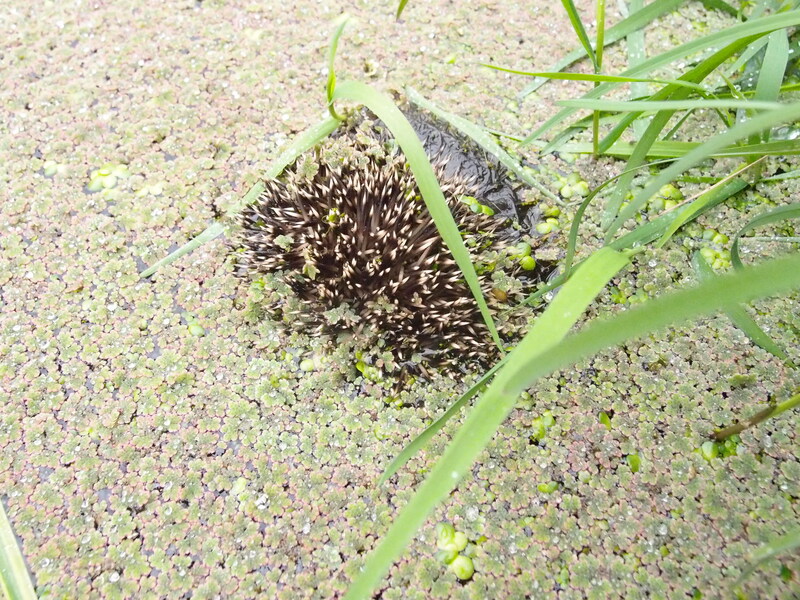 For large species, count two to three times that surface. At these low densities, the fish will grow to maturity without problem. In the stack: Cynopoecilus melanotaenia (Paso del Dragon), Austrolebias charrua (Canal Andreoni), Austrolebias patriciae (Cruce Ferrocaril), Austrolebias vandenbergi (Talon Cansado), Austrolebias reicherti (Paso del Dragon), Austrolebias luteoflammulatus (Ruta 15km7.5, Canal Andreoni), Austrolebias gymnoventris (Velasquez). Inside the wooden house, there is still fry approaching maturity. 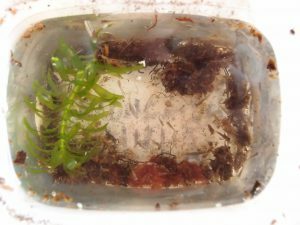 They were born a few weeks ago and have been fed once with Artemia, after that with pond invertebrates. 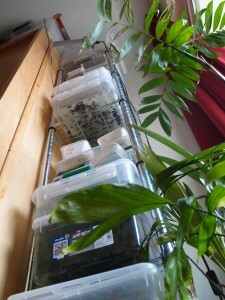 Now they will need to overwinter at relatively small sizes and without heating. Critical to make this work seems to be using tanks with a large surface and low depth and to have sufficient thermal mass in the house. When I see a plastic box in a shop, I get the feeling I can predict how many I can raise in there to maturity, just by looking at the surface area. 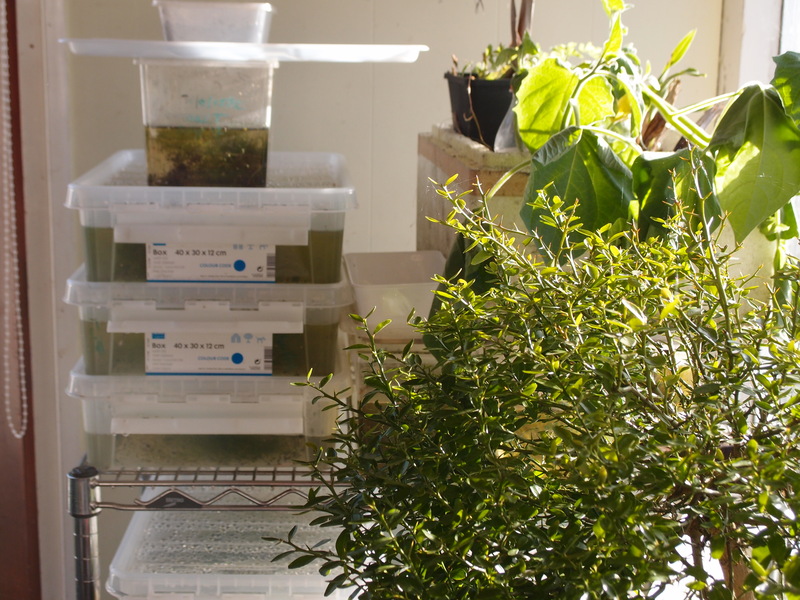 Maybe it’s time now to start experiments on density-dependent growth and survival in my fish. In the house I also store orchids (Zygopetalum), palm trees (Archontophoenix) and citrus (Yuzu, finger lime) during winter and cuttings of Physalis Peruvian groundcherry. Adults of A. melanoorus “R5KM399”. 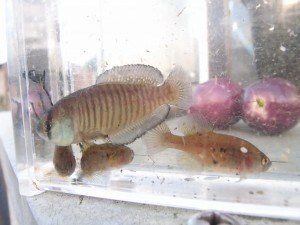 I collected them today, November 17, to move them inside into a 40 liter aquarium. The fish have been out since June. In this species, I particularly like the patterns of spots and lines on the fins of the males and the bar through the eyes.The females often have blobs on the flank, variable in size and number. There are 15 more tanks outside to check and move. No frost foreseen yet. This guy has made a wrong decision or has just been unlucky. I spotted him while fishing Chaoborus. That isn’t very easy at the moment, due to the layer of Asolla cristata. I try to remove it every week and plan to use it as a soil fertilizer. 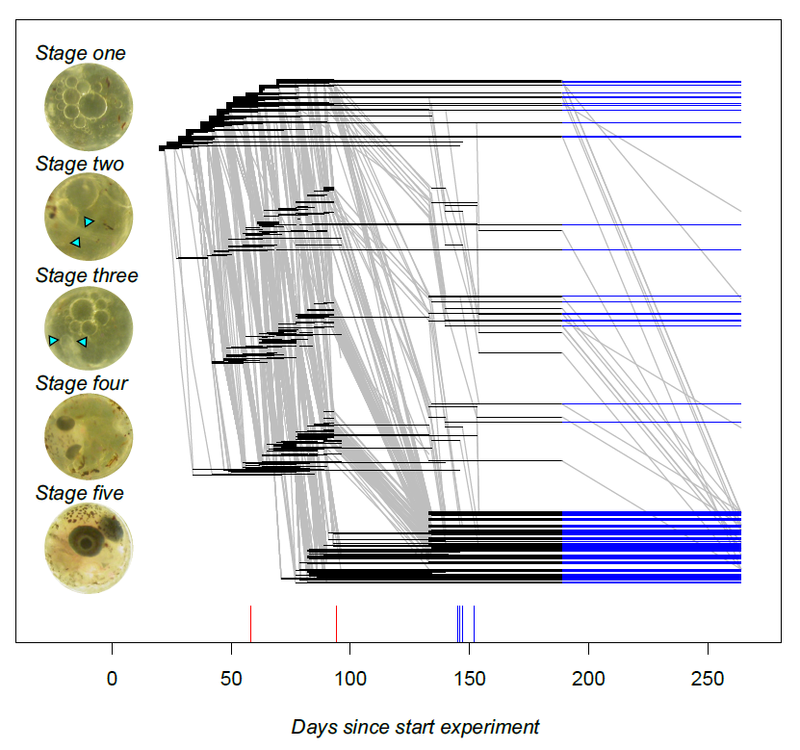 We (Irma Varela Lasheras and myself) did detailed demographic work on A. bellottii embryos and found that these respond relatively little to being incubated in either water or air with high humidity. The eggs were incubated in multiwell plates, and this allows a very easy follow-up of the embryos, and a good yield of developed embryos. 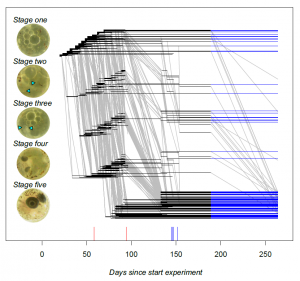 I am happy with the results and they take me all the way back to the start of my PhD thesis, when I read Prof. Michio Hori‘s thesis on Cicindela japonica, in which he did a demographic study of three stages of tiger beetle larvae with graphs similar to the one I show in this post.